4 top tips and 3 lovely quotes! From our Birmingham schools…. 18th February 2016 - 4 top tips and 3 lovely quotes! From our Birmingham schools…. 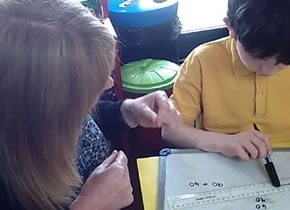 We found it most effective when our TAs worked with children in their year group so they were able to easily link sessions with what the children were doing in their lessons. Make a Catch Up® area in school, and put up key vocabulary posters around the school to help as reminders. Share the numeracy learner profile with the child and let them choose what they do next – it’s really motivating to give them ownership, so they come saying 'I've chosen to look at this area next' and they really want to do it because they chose it. The interventions are most effective when they are managed properly and, ideally, the person who is managing the intervention comes along to the training. Many thanks again to the schools who presented at our ‘Implementing and sustaining high-impact literacy and numeracy interventions’ lunchtime seminar in January – thanks for sharing your top tips and stories of success with us and all of the other schools there!